"Softland is a solo project with a determined do-it-yourself mentality. 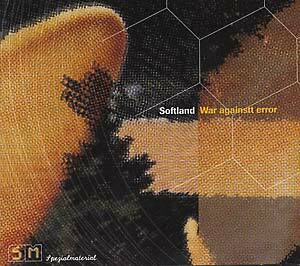 War Againstt Error is Zürich-based Christof Steinmann's second album, after his debut One Is A Very Small Crowd (2003), and consists of six longer, experimental vocal pop songs written between 1997 and 2005. The stylistic bandwidth spans melancholy lo-fi pop songs and chanson parody to bewildering soundscapes, unexpectedly morphing into intricately arranged electronic tunes in full cinemascopic format. There's a common and particular tendency towards eclecticism, apparent in opulent, playful song structures and an almost outrageous combination of stylistic influences drawn from imaginary folk, electroacoustic or minimal music. The CD-version adds several more tracks and broadens the spectrum of the six core tracks by interlacing them with field recordings and weaving the whole into a soundtrack-montage, considerably exceeding the length of a standard pop album. Using field recordings as a basis, the tracks combine acoustic instruments such as double bass, harmonium, recorder and voice with synthetic sounds derived from analog sources and digital processing. In his exploration of unusual timbres, sounds and harmonies, Softland uses a limited instrumental technique as consciously as chance algorithms, software abuse and an alchemical trial-and-error strategy within his compositions. By layering, filtering, cutting and pasting, what seems initially like a lack of precision, grows into a dense structure of intricate rhythms and complex harmonies. The end result retains both pop and club culture as core reference points, while at times stretching the boundaries of these genres beyond recognition."